Air in worm farms is essential otherwise expect an anaerobic stench. Air in worm farms is very necessary otherwise an anaerobic stink will soon inform you that all is not well in the state of Denmark. Worse, the temperature will rise and they'll be crawling out of your container. Worms are aerobic creatures, just like us; they need oxygen to exist. With not enough air near the bottom of the container, they won't delve deep into the feedstock and then it will rot and smell. This page was last updated by Bernard Preston on 22nd March, 2019. To prevent this problem it's important in the first instance to add plenty of friable material. Various authorities recommend the use of cardboard in worm farms; it also raises the carbon content which is important for the critters. However, I'm reluctant to do that because of the chemicals used in the manufacture. Our solution is to add the outer leaves of cabbages, the roots and stems too, that have been roughly chopped up with a garden spade; they are plentiful here, but any coarse organic material from the garden would do. This friable material must be well worked into the rotting food that is being used, but be careful not to make an impermeable layer to both the worms and oxygen. Do not compact the feedstock down; it should be as rough and crumbly as possible to let in the air. Recent experiments suggest that best of all is to cover the contents of your worm farm with a loose array of whole cabbage leaves; they love the dark, and when you lift a leaf you'll find a myriad of creepy crawlies just below. Air in worm farms can be helped by regular tossing of the contents of the container. We recommend that once a week you take a garden fork and gently work the contents of your worm farms; loosen the material, allowing air deep into the container. Don't try to invert the feedstock; twisting the implement slightly will allow oxygen to get to the wrigglies nearer the bottom. In particular, look for any areas where the material is compacted; gently tossing it will help prevent any anaerobic bacteria from flourishing. Watch out for an unpleasant smell, and any sign of the worms crawling out of the container. This is especially true if it gets too hot, either from the ambient temperature, or too much nitrogen rich feedstock. Remember that the worms can be injured; don't use a garden spade that would cut some of them in half and kill them; you won't end up with two living wrigglies, but one dead one. Having said all this, the worms are amazingly tolerant provided you use a modicum of common sense. The material mustn't be too dry, nor should it be flooded with rainwater; a proper roof and drainage at the bottom is important. If no leachate drips from the bottom into your bucket, it may be too dry; use a watering can; if you get too much liquid leaking out, then it's probably too wet. I took the photograph at the top of this page; in retrospect it appears to be too wet, but the worms are obviously flourishing despite it. Turning over a corner of your farm and seeing if the worms are proliferating is perhaps the best measure of the health of your beasties. Ideally there should be thick clumps of wriggling nematodes, to give them their biological name. Building worm farms is not rocket science. 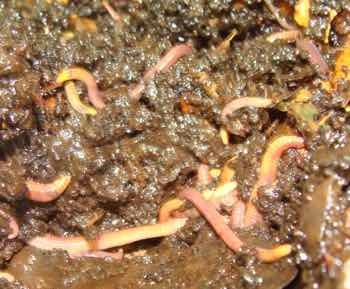 It's a wonder what both leachate (erroneously called worm wee) and the vermicast (the compost formed) will do to enrich your garden. Growing broad beans (also known as favas) is important to me, in part for the vegetable protein but also for the L-dopa they provide for the tremor in my hand. Since using leachate from our well-aired worm farms, the plants grow to over six foot tall. No inorganic fertiliser is necessary. But if they start to stink, firstly remove the leachate more regularly, and secondly think about more air in worm farms. Another way to get more air to the bottom of your container is to use cardboard in worm farms; it acts as a bulking agent. Both the leachate and the vermicast have greatly improved the quality of our vegetables; getting your garden soil ready is a long slow process that can be greatly enhanced with the use of worm farms. The leachate (worm wee) also acts as an important non toxic part of natural pest management; dilute and water it onto the leaves of your plants, but not those like lettuce that you are about to eat. Few things will kill your worms faster than becoming water logged. If there's heavy rain expected, it would be wise to cover the farms with a tarpaulin so that the worms still have plenty of air.